The ultimate guide for new parents and anyone interested in learning more about the mitzvah of Bris Milah â€” ritual circumcision. This all-in-one guide includes everything you need to know, plus all relevant prayers and blessings. Great for expectant parents, new parents, and a special memento for all your guests at the Bris ceremony. 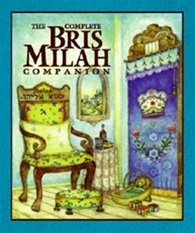 â€¢ A comprehensive introduction and overview of Bris Milah, chapters on Pregnancy and Birth, Shalom Zochor, Choosing a Name, and more. â€¢ All prayers and liturgy for the Bris ceremony in clearly set Hebrew, along with easy-to-read English transliteration and translation. â€¢ The entire Grace After Meals, with all additions. â€¢ The ceremony for naming a baby girl. â€¢ A selection of basic Jewish prayers for the childâ€™s early years.